NUA students have the opportunity to gain professional experience through live projects, also known as live briefs. Live projects are set by real clients from the world of business, media and the non-profit sector who have a genuine design need. Students and their clients work in real time toward the actual production or realisation of their designs. 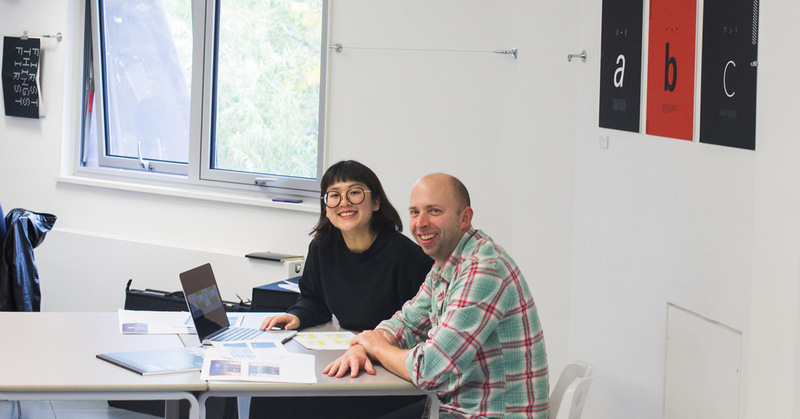 Students typically work on live briefs as part of their studio practice, but they can also be paid for working on projects managed by Ideas Factory NUA. This first-hand professional experience is a valuable learning tool for students and essential preparation for life after graduation. NUA Curates features Singaporean Melissa Lim Shuen, a 2017 NUA graduate. Melissa joined the BA (Hons) Graphic Communication course in the second year, having completed her diploma in Singapore. During that time, she took part in live projects, showcases and contests. Her final Degree Show project was an usual but truly outstanding result. Titled Virtual Purgatory was an interactive installation design to provoke questions about the adverse effects of life lived on line. How are our digital media habits informing (and harming) our daily lives in the real world? Using humour, well-crafted design and insight, Melissa called on her core skill as a designer: provoking thought through visual communication. Melissa’s work was awarded the Vice Chancellor’s commendation. See more of Melissa’s works: http://in.form.show/mlim/, and she shares her experiences here. The Baxter Healthcare brief was a five-week group project split into two parts. Firstly, we were asked to design a comprehensive typographic visual system to improve the identification and labelling of various boards around the factory. Second, we were tasked with designing a system for displaying information about Baxter that celebrates their work in the foyer. What research did you conduct on the company/their product lines before you set out working on the project? Research is very important for any project. As a group, we started out by researching the background of the company – understanding the company’s brand values, operating approaches, messages – which could help us to come up with design solutions that would fit with Baxter’s brand identity. How does the introduction of a client affect your design approach? When a real client is involved in the project, there are more things to consider. Often the briefs that we get don’t have a real client attached to it, which means there is no budget assigned so the temptation is to go wild and suggest design solutions that may be a little hard to execute in real life. However, during this live project, we had to take into consideration practicality and budget, while maintaining aesthetics for the design solution. Were there moments when you had to reign in your creative impulses to be more responsible to the client/the brief? As a designer, our primary role is to come up with design solutions that answer the brief. Of course, there are times we thought we’d found a perfect design solution but due to cost and practicality, we had to compromise and find a balance. What feedback did you receive through the process, both from your lecturers and the client? We were fortunate to have a few tutorials with our lecturers, Martin, Nigel and Darren, which were like a simulation of our presentation to the client before the actual one. They gave us practical feedback, which helped refine our design proposal to the client. On the actual day of the presentation, we were glad that the client liked the design proposal and was keen to execute it. What were the central challenges of the live project? This live project happened at the same time as other ongoing projects and it had a tight timeline of only five weeks. Also, as it was a group project, there were times when it was difficult to come to a unified agreement on certain aspects. Despite that, the team managed to communicate and balance everything well and got things done. The live projects happen at the same time as a lot of other projects. How did you balance all of those expectations? Yes, it was a very busy period indeed. Thankfully I’m a last-minute adrenaline worker so my method of working is to plan and prioritise what needs to be done first, have a to-do list to help keep things in check and strike off one at a time. It’s just more productive this way for me and I’m glad I managed to pull through! Melissa's interview was published on the third issue of Flint Magazine, an annual publication that provides a curated, inspiring and measured review of the exciting lives of NUA's students, staff and alumni. If you'd like a copy of Flint, feel free to reach out to us at hello@therightu.com. September 2017: This is a part of a new series called NUA Curates, that Norwich University of the Arts is collaborating with theRightU to feature works from international students, placing them at the forefront and celebrating their works. We've also compiled their individual experiences and how their time at NUA has prepared them professionally for their future careers. If you'd like more details, please reach out to us at hello@therightu.com.